Hello and welcome everyone. 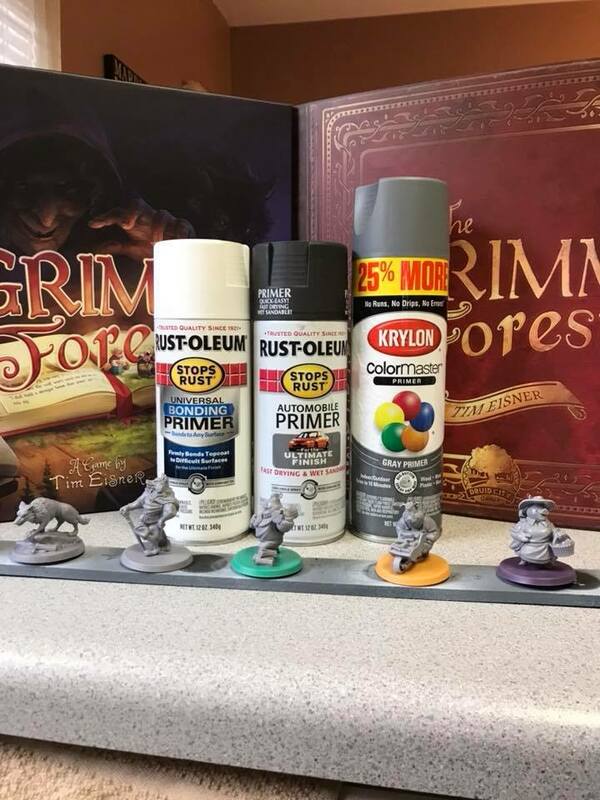 Today, thanks to our local friend, Josh Roe, we are excited to bring to you a step by step guide to painting The Grimm Forest! If you've never painted before or you're nervous about "messing up your minis" then you're the target audience! We want to help our fans branch out and unlock your hidden potential! So, dust off those paints, break out the brushes, and get ready for an adventure! "As promised, here is my progress on the Grimm Forest miniatures. Although I have pictured all of the models in the prep phase, the next series will focus on putting paint on a little pig model. I’m not a professional painter by any means. My hope is to show everyone that views the guide that painting miniatures does not have to be a scary process. The first step involves removing some pesky mold lines. This will involve patience. You will want to use a hobby knife. This is commonly called an x-acto knife. This tool is very sharp, so be extremely careful. While cleaning mold lines, you may have a figure pop off the base. Don’t freak out. This is can be a good thing. This allowed me to more easily reach mold lines on the underside of the model. To reattach the figure, use super glue. Loctite is a great and easy to find brand. Now the models are ready for a bath. This is to accomplish two main goals. The warm soapy water removes the mold releasing agent, allowing paint to adhere to the models. It also helps remove any lose plastic shavings from the mold line removal process. A soapy wolf is a happy wolf. Use regular dish washing soap for this. If it’s good enough to remove oil from baby ducks, it’s good enough for your models. Use hot water to rinse off. It doesn’t need to be scalding, just hot enough to touch. 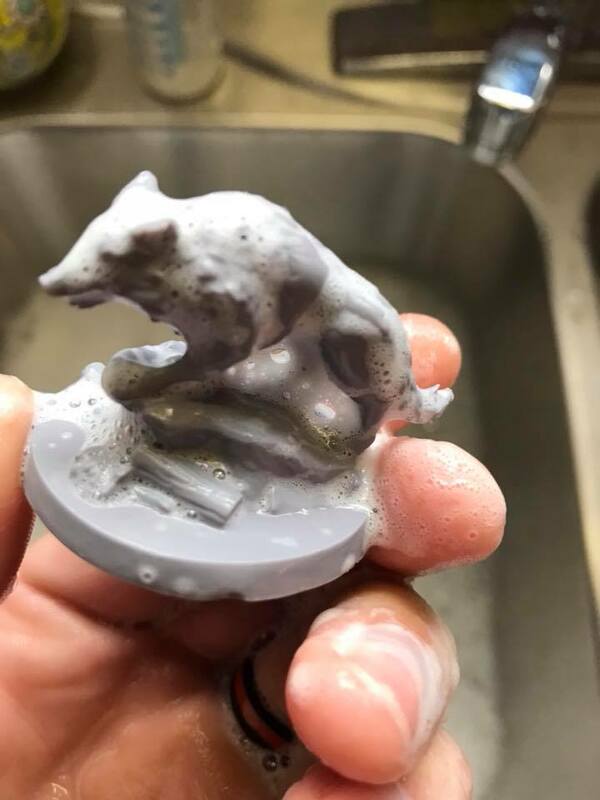 This will not only rinse your models clean, it will make the plastic soft enough to reshape. Some of the bases may have a little warp to them. Apply hot water, bend plastic to desired position, then let cool. Try to get your hands on some poster tack. It’s easy to find and will come in handy during priming. In this photo, you can see that I’ve placed a small bit of tack under each model. I attached my models to a small piece of wood. Thick cardboard will also work. The magic of poster tack! Now you will be able to apply paint to the under side of your models with ease. Now we are ready to prime! I use rattle cans. Note that if you live in a humid environment, it will affect the spray. When in doubt, practice on something you don’t care about. Also note that different sprays will affect the brightness of the colors applied on top of the primer. Black will give you dark or muted colors. White will make tones brighter. The models have been primed. Many small coats were used to obtain an even surface. You never want to apply a heavy coat. This will cause the paint to run and hide the beautiful details of your models. Time for a more advanced technique. All of my models were primed solid black first. I then used white primer to spray directly above the miniatures. This catches all the details from the models. The white acts like a source of light, while the black acts like shadows. See how the white catches the bricks, while leaving the mortar in between untouched? Be sure to let your primer “cure.” This means letting it completely dry for a period of 24hrs or longer. Thanks for reading! Although I have pictured all the models in the prep phase, the next series will focus on putting paint on a little pig model. Be sure to follow along and look for Part 2 soon!